ATLANTIC—The magical Isle of Verity, home of the Lyceum, has long served as a hub for knowledge and learning. Yet, perhaps more importantly, the Isle is a mainstay of Atlantic history: the Atlantic mage Tower, one of Atlantic’s most renowned establishments, was once located here. Verity has seen many visitors over the years, but one guild has chosen to make the Isle its permanent home. 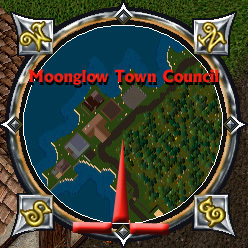 The Moonglow Town Council (MTC), based in the city of Moonglow, was founded to establish a government for the citizens of the Isle of Verity. When GreyPawn, a former Seer and a figure of legend on Atlantic, established the Council, his intent was to build a virtuous community, justly governed, who called Verity their home. The MTC is one of the first – and perhaps the most historic – player governments on Atlantic. The MTC has promoted many changes to Moonglow over the years, some of which have resulted in lasting changes. Organized as a magocracy, the MTC is lead by a strong executive – namely, its mayor. The mayor appoints council members, who carry out the directives of the executive. Several of these council members also hold special positions, including the vice-mayor, chancellor, minister of defense, and minister of commerce. The key to MTC’s growth and success, according to GreyPawn, lies in its tradition of strong leadership. In addition to formal leadership, the MTC also has a vibrant aristocracy, as well as several “hero-level characters,” in GreyPawn’s words. Humanis and the Orcs are notable characters whose success, in many ways, stemmed from their early roles in the MTC. Despite the MTC’s strength and permanence since its founding nearly ten years ago, the Council has also faced its share of challenges. As a functioning city government, one of the MTC’s primary focuses has been encouraging widespread participation. “Inactivity has been the biggest challenge MTC has encountered in its history. Ensuring the survival and continuity of a functional Moonglow government in spite of the natural ebb and flow of activity has been at the top of our priorities,” said GreyPawn. Over the past decade, Britannia has undergone innumerable changes: new places, new people, and new rules have forever altered how Atlantians conduct their virtual lives. In response to these changes, the MTC has evolved to ensure that it is always ready to meet the needs of its citizens. The MTC relies heavily on the loyalty and virtue of its core membership. MTC’s motto is “semper veritas,” which is translated “always truth.” It is customary for MTC members to greet one another with this phrase. The MTC creed, according to GreyPawn, “is that Moonglow Endures, and we are sworn to continue to serve our shard and our city as best we can.